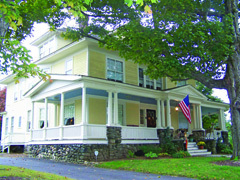 Relax and unwind in our Colonial Revival home, built in 1900, and located in the historic Torringford area of Torrington CT. Our guest rooms are refreshing and elegantly decorated with antiques in the traditional Manor style with air-conditioning, wireless high speed Internet, and small office capabilities; some with private baths! Breakfast is freshly prepared, and served in our sunny and bright breakfast room. Enjoy reading in our library, lounging in our parlor, or relax outdoors on our scenic wraparound porch. 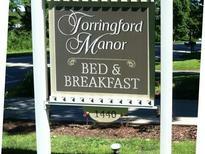 The Torringford Manor Bed & Breakfast is located within close proximity to shopping, dining & business district, yet secluded to provide the sought after ambiance of Litchfield Hills. Enjoy the local attractions of Litchfield Hills, including the Historic Warner Theatre, Nutmeg Conservatory for the arts, award winning Vineyards, farms, as well as, antiquing, skiing, jogging, tubing, dining, and golfing close by. Perfect Setting for Romantic Kindling, Business Travelers, Theatre or Show Events, Family Vacations, and Reunions with Friends. Special arrangments possible for Celebrations. Call 860.201.5459 for Reservations or More Information!